Here at West Dwelling, we strive to provide our customers a variety of products like this set of mini potted plants that will inspire our customers with creative and vintage living! - Decorations for weddings & birthdays - they even make a great wedding or birthday gifts! - Gives indoor homes a touch of greenery. Great centerpieces for any table, or great displays for your shelves or mantle. Bring the botanical garden feel into your home without any of the maintenance! West Dwelling is a small family-owned business dedicated to provide the highest quality products with the highest quality customer service to spread smiles and let our clients be a part of our family. Check us out! APPROXIMATE SIZE: 4.3" Width X 4.7" Height. Bring some fresh spring décor arrangements into your home! Small & lightweight! 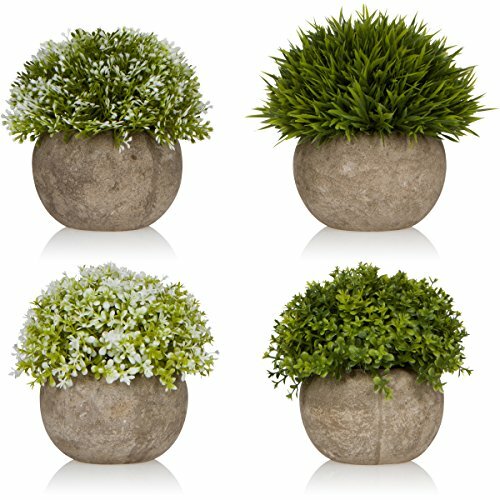 DECORATIVE REALISTIC LOOK - our colorful potted plants are perfect for any rustic, farmhouse, or modern style. We carefully craft each set with the highest quality making them look natural and real. PLACE THEM ANYWHERE - These make beautiful tabletop ornaments around the house, kitchen, bathroom, bedroom, living or dining room. Makes a great centerpiece accent! You can even take them outdoors to display on your porch! WONDERFUL GIFT IDEA - Our set comes with 4 plants each with a unique design. Give these to your friends or make them your own! AMERICAN SERVICE & SUPPORT - As a small family business we stand by our quality and official 2-year warranty. Should you ever have an issue with our potted artificial plants, we will replace it 100% free of charge! If you have any questions about this product by West Dwelling, contact us by completing and submitting the form below. If you are looking for a specif part number, please include it with your message.